I was the featured speaker at this event hosted by the NYC Next Generation Board held on July 28th, 2010 at CitiField in NYC. 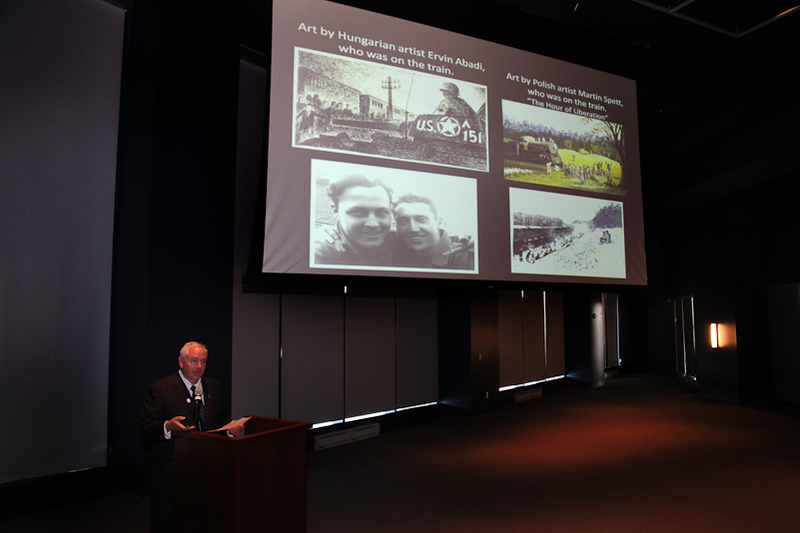 I spoke about this project and on behalf of the United States Holocaust Memorial Museum’s Teacher Fellowship Program. Good evening and thank you for your welcome. I would like to thank the Next Generation Board and staff for having me here this evening. As you have just heard, I am particularly devoted to the mission of the United States Holocaust Memorial Museum’s Teacher Fellowship program. In April I was honored to be in Washington, DC with these fine veterans at the Days of Remembrance ceremonies with over 100 other liberators. Tonight I would like to present you with some snapshots of the people I have encountered in my work, and how the ripple effect has led to these worldwide connections. I also think it is important to place my work in the context of the Museum’s mission and to place it in a perspective that illustrates why we are all gathered here this evening. As Ms. Sawyer explained, this endeavor began as a simple oral history project and it has now taken on a life of its own. The photograph on the screen was taken by Major Clarence Benjamin and is one of the most dramatic liberation photographs ever to come to light. What is unique about this and the other ten liberator photographs is that we have now identified several persons who are still living. They in turn contact other survivors and their families. Some just stumble across my website. On Holocaust Remembrance Day in Israel, April 12th, a major Israeli daily that reaches a quarter million households ran a lead story; here in NY the newspaper Hamodia ran an article that reached 50,000 in January. This has multiplied the ripple effect; to date, we have uncovered 165 survivors who were aboard that train near Magdeburg Germany. Right now, rescuing the evidence is my main mission. There are so many lessons here – lessons of self-sacrifice and duty, of courage and kindness, but also of horror, cruelty and sorrow. This war brought out the worst in people and it brought out the best of people. And when you look at this mini snapshot of time, you see it all. In the end, good triumphs over evil. Here are some sample vignettes from my work with the testimony of survivors I know, and this is just scratching the surface. Here they recall the moment of liberation at the hands of the Americans. Jacob, a four year old boy, has very vivid memories of recalling that this was the first time in his young life that he ever saw an adult smile. He also recalls an angry American major cocking his .45 and putting it to the head of a burgermiester who was reluctant to order the neighboring townspeople to provide shelter and food for the starving victims, a story which has been corroborated by many survivors. Ina, a seventeen year old Dutch Jew, remembered the straight white teeth of her liberators and thinking in her famished and confused state that they all must have had the same dentist. Micha, a six year old boy from Poland, remembers visits to the house where he and his mom were quartered by a huge black American soldier who constantly smiled, bringing him chocolate, which he had never tasted before. Matthew Rozell at CitiField event, July 28, 2010. USHMM photo. 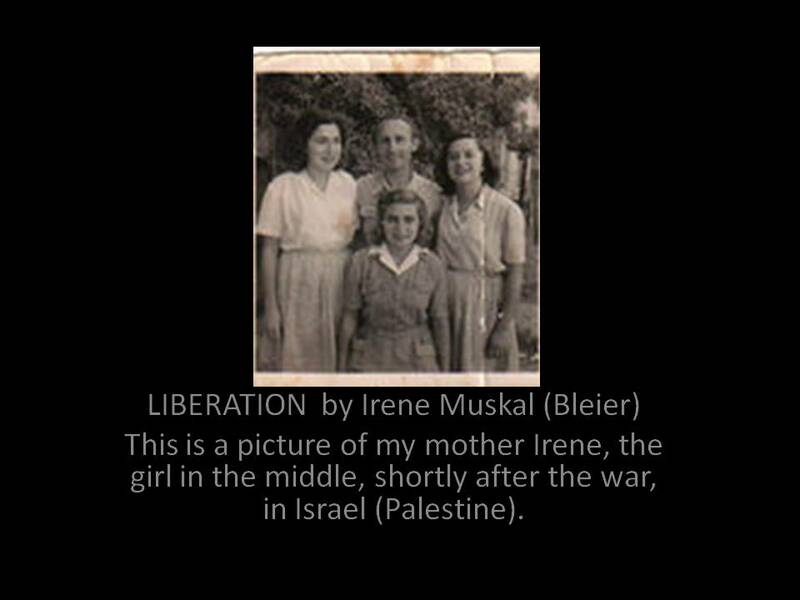 Most recently, this was confirmed once more by this woman, a little girl who had been an orphan in Bergen Belsen. Back in Israel where she lives, she got a phone call from the daughter of another survivor who had tracked her down. Lily got a call as she was cooking dinner at home for her extended family in Tel Aviv last March, and was completely shocked as she knew very little of the details of her early life. She did immediately decide to travel to the United States to meet me, and came up here about a month ago. Lily’s father had been shot in the Warsaw ghetto and her mother died in Belsen shortly after their arrival. She was “purchased” with bread rations from a man who she had been entrusted to but who was actually neglecting her, and then she was cared for by a series of women whose faces and names she cannot recall. Eventually she was taken to Israel and raise on a kibbutz, and when she met me; she confided that she did not even know her birth date. She did remember the liberation, that all these young soldiers were chewing gum and gave her her first chocolates. I then arranged for her to have an interview at the Museum, and she called me up, very excitedly after the fact to say that she was received very well, and that her interviewer even had done research in the archives before she had gotten there and was able to tell her the day she was born…June 15th. As she and many others have told me, her family is proof that Hitler did not win. I’d like to think that this project has done a great deal to undo Hitler’s legacy. The ripple effect of that we spoke of is reaching many thousands of lives- liberators, survivors, their children and grandchildren, and generations to come. In perspective, though, we have to understand that for every soul saved on the train, another 2500 perished during the Holocaust. Just as importantly, the project has touch thousands of students. You see, one of the points that I stress is that now these students become the new witnesses, just as you are also here to hopefully help us to carry the ripple forward to the future generations. I point out to the kids that they have a responsibility now to use what they have witnessed, and I show them the Holocaust denial website that is out there specifically devoted to the refuting of my story. It’s still out there, and ignoring it is not going to go make it go away. 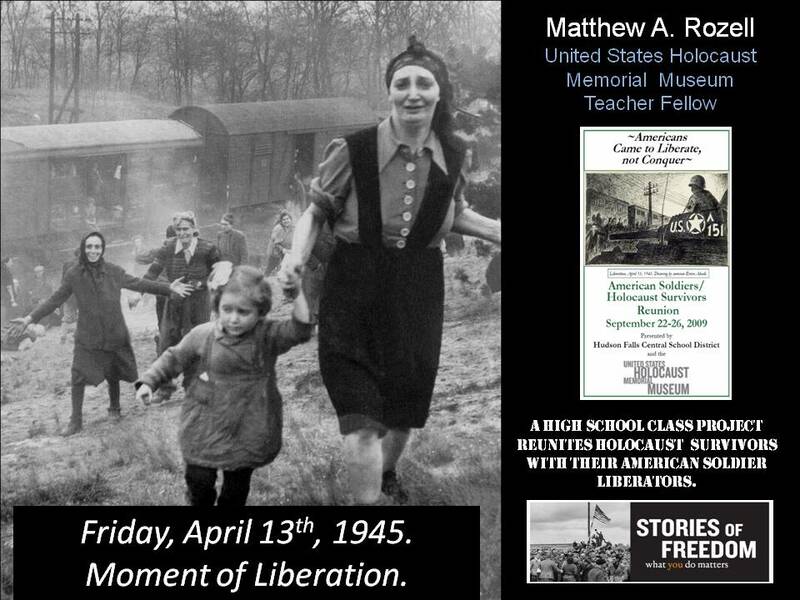 I have talked to plenty of my peers who did not really learn about the Holocaust in own their days in the classroom, and who really have difficulty grasping how to teach it effectively. There is a lot more to teaching about the Holocaust than collecting bottle caps or counting pull tabs in a crate. Realistically, only a handful can bring their students to the Museum in Washington, but what we have to realize is that this Museum is much more than a brick and mortar building. As was previously mentioned, the Museum Teacher Fellowship program has developed into cutting edge national outreach to nurture Holocaust education in this nation, but a lot more needs to be done. Last year the Education Division reached 5000 teachers across the nation, and the good news is that the ripple effect means that if each committed teacher reaches 100 students over the course of ten years or so, we have now carried the message to fifty thousand kids. In perspective, however, we have to keep in mind that there are at least 14 million secondary school students in the United States. But just imagine the potential of a program where even more highly qualified and committed MTF teachers could be trained to reach 100 or more fellow teachers over the years! People often ask me how my work as an MTF impacts students. For a long time I really struggled with this question-I myself have never taken students on a field trip to the Museum-until last month when a reporter for my college alumni magazine showed up in town to find out. My friends, these high school kids now know that what they do matters, and whatever we can do to support these programs will pay dividends later. Now I can say truly that my getting up and going to work each day makes a difference. And now like them, when it comes down to what really matters, I just can’t be a bystander. Thank you for your attention and I hope that you enjoy the game. 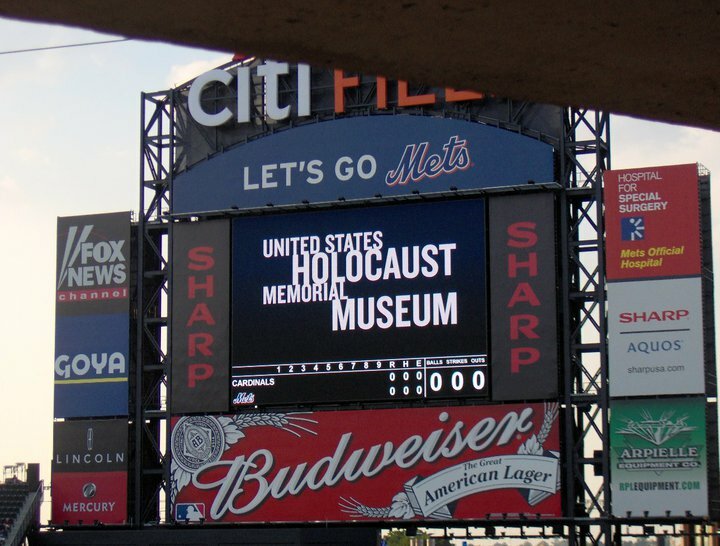 28 July, 2010 the United States Holocaust Memorial Museum’s New York Next Generation Citi Field event to commemorate the 65th anniversary of the liberation of the Nazi concentration camps.